In a bid to accelerate its regulatory process, China is now accepting overseas trial data in drug applications, and the latest to take advantage of that is Swiss drug maker Roche, which today received an approval to market its lung cancer treatment Alecensa in the country. China’s National Drug Administration (CNDA) has green lighted the drug to treat anaplastic lymphoma kinase (ALK-positive), advanced, non small cell lung cancer (NSCLC), less than a year after European and US approvals. Roche’s chief medical officer and head of global product development Sandra Horning said the speedy process represents a “significant regulatory shift, with the approval received under unprecedented timelines”. Lung cancer incidence rates are on the rise in China, with the disease being the most commonly diagnosed cancer type, and the leading cause of cancer-related deaths. The approval is based on data from the global phase III ALEX study, which evaluated Alecensa against Pfizer’s Xalkori, the current standard of care. Updated results from the study, which were presented at the 2018 ASCO conference, showed that progression-free survival rates more than tripled in those on Alecensa compared to those taking Xalkori (34.8 months versus 10.9 months). Furthermore, Alecensa met its primary endpoint, showing that first-line use significantly reduced the risk of disease worsening or death compared to Xalkori in Asian patients with ALK-positive NSCLC. These results will be submitted to the CNDA to complete a post-approval agreement. The approval is an important one for Roche, which is solidifying its position in the world’s second biggest drug market. 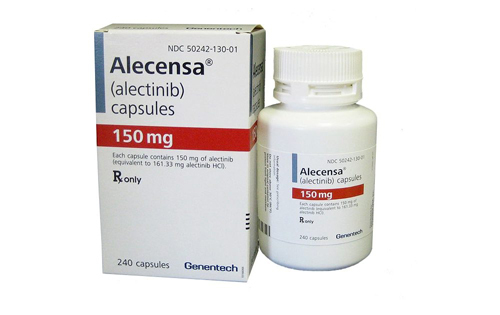 Alecensa is now approved in over 57 countries as a first-line treatment for ALK-positive NSCLC.